In fact, about one in six men will be diagnosed with this condition during their lifetime. And these epidemic statistics don’t even include the disabilities and deaths that occur in response to prostate cancer treatment. So it’s always nice to see research results that point to a potential cancer killer like red clover. Let’s take a look at the study. 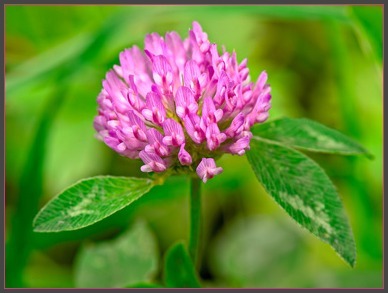 Red clover contains a weak phytoestrogen called formononetin. Now before going any further, I know that some of you object to using a phytoestrogen for prostate cancer. Please keep in mind that clinical studies have shown that some phytoestrogens have anti-cancer properties.2,3 And the present study we’re talking about today supports the same conclusion. Plant-derived compounds called isoflavones,which are abundant in soybeans, modulate estrogen signaling in the human body via interaction with estrogen receptors. Thus, these compounds are sometimes classified as “phytoestrogens”. Supplementation with soy isoflavones has been found to reduce PSA levels in men with prostate cancer7, and a soy-based dietary supplement containing isoflavones, lycopene, silymarin, and antioxidants was shown to significantly delay PSA progression in patients who underwent curative treatment for prostate cancer8. In addition to preventing prostate cell proliferation, isoflavones may increase programmed cell death (i.e., apoptosis) in low-to-moderate grade tumors from prostate cancer patients. And lastly, a study designed to examine fat intake in relation to lethal prostate cancer and all-cause mortality was published this month in the Journal of the American Medical Association. The results showed that among men with non-metastatic prostate cancer (cancer that is contained within the prostate gland), replacing carbohydrates and animal fat with vegetable fat reduces the risk of all-cause mortality. So what does this mean? Pretty simple. Eat less animal fat and more vegetables! Something all of us inherently know we should be doing. Maturitas. 2013 Jun;75(2):125-30. doi: 10.1016/j.maturitas.2013.03.006. Epub 2013 Apr 6. Horm Metab Res. 2012 Apr;44(4):263-7. J AOAC Int. 2006 Jul-Aug;89(4):1121-34. Am J Epidemiol. 1984 Aug;120(2):244-50. National Cancer Institute. http://dceg.cancer.gov/research/cancer-types/prostate/shanghai-case-control-study-prostate-cancer. Accessed 6/28/2013. JAMA Intern Med. 2013 Jun;10:1-8. If I’m not mistaken you released an article a few years ago, that was written by a Harvard MD that said it’s the testosterone that was preventing prostate cancer in older men that didn’t already have prostate cancer. As men get older, their estrogen goes up which might be the reason for an increase in this cancer in older men. The testosterone keeps men at a younger level and younger men usually don’t get prostate cancer. Now you are recommending phytoestrogens and soy isoflavones which would raise the estrogen in older men. Am I not remembering correctly? Anonymous - It's important to differentiate between the types of estrogens found in a man's body. There is estradiol, a potent form of estrogen which has been shown to damage the DNA of prostate cell genes. Phytoestrogens, on the other hand, are weak and bind to estrogen beta receptors, an effect which protects against the proliferation of prostate cancer cells. Red clover is a phytoestrogen. Thank you for sharing this information. With this and the recent news about eating raw garlic, it really does seem like cancer research has been providing clues to more feasible methods of prevention. I'll admit that I still love my steak, but veggies are definitely gonna be playing a bigger role in my meals! Stephen Knows Cancer - Our pleasure! Is the idea of using red clover for men with prostate issues still sound? Do you think it would help with urine retention? My husband recently saw a urologist and his PSA seems fine, but his bladder is holding more urine than he should. An ultrasound was done and the doctor did not see anything unusual other than his bladder not emptying all the way. He takes a supplement with saw palmetto, lycopene, beta-sitosterol, stinging nettle, pumpkin seed oil, selenium, zinc, etc in it, but lacks red clover. Do you think red clover would assist, in time, with this issue? I read that it could. I would love to know your thoughts. Thank you! Prostatitis is the inflammation (swelling) of the prostate gland. It can be very painful and distressing, but will often get better eventually. The best option is to take prostatitis treatment.